Calvin and Hobbes go meta. Footage (specifically, close shots) of people ... talking, with little or no other action. Theoretically easy to write and definitely cheap to film, Talking Heads can be boring. The term was originally coined in the 70s to describe advertisements shot in this style. Talking Heads has since been used as a criticism for media that relied heavily on dialog. As American Television and Hollywood became more "cerebral" in the early to mid 90s, the media became noticeably more Talking Heady: Complicated police procedural and legal dramas popular at the time relied on interviews and testimonies, while comedy aped the Seinfeld and Pulp Fiction style of rambling, slice-of-life dialog. Bill Watterson complained that Newspaper Comics are moving in this direction, probably due to a combination of Cerebus Syndrome and Lazy Artists, though he blames restrictions placed on them by newspapers. Also notable is UK comedy show Peep Show, the entire premise is based around talking heads (because each shot is from the perspective of another person in the scene). Of course, the actual Talking Heads by Alan Bennett conforms to this trope, essentially monologues (with one phantom policeman). The band Talking Heads (fronted by David Byrne), however, does not. Even their famous concert film, Stop Making Sense, is completely free of Talking Heads, a rarity in a genre typically saturated with them. Reading only exported or scanlated manga can easily make one believe that some unwritten manga code states no work can go without dramatic poses, great drama, and eye candy. Talking Heads seem to be generally discouraged, but they are still around, mainly as one-shots. Don't expect to see them in English. Death Note (especially the manga) falls into this trap every now and then, and it's very noticable. Frank Miller's The Dark Knight Strikes Again has a lot of these. A LOT. Gets to be kind of Anvilicious at times. The interview scenes in Silence of the Lambs consist mostly of headshots of Clarice and Lector. However, this serves to add to the drama of the scenes as there is no focus other than the two characters and their emotions. Later on, this technique is used again when Clarice and her friend are discussing the case and Lector's comments. The Man From Earth is mostly this. As mentioned, Bill Watterson felt this way about modern newspaper comics, and brought it up once in a strip of Calvin and Hobbes that had Calvin telling Hobbes how his grandfather feels that modern newspaper comics have just become a bunch of "Xeroxed talking heads". 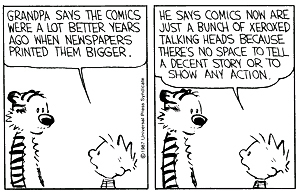 The joke, of course, being that the particular strip consists entirely of images of Calvin and Hobbes' heads. Several main characters (and most Enclave soldiers in Powered Armor) in Fallout and Fallout 2 have animated Talking Heads with lip-synced voice acting for their dialogue window. This is even how the developers referred to them. Other characters simply show their world model and communicate via written text. A few, such as John Cassidy from Fallout 2, had Talking Heads animated but no voice-acting recorded (mostly due to looming deadlines), and were thus left out. Most can be restored via game mods, but are still silent. Most of Mega Man 10's story cutscenes have caught some flack due to being made of still images, scrolling text and little else. It doesn't help that some players think that the game's presentation required minimal effort to make. Eight Bit Theater gets pretty close to this trope at times, especially towards the end. Thinkin' Lincoln of course. Emphasis on the 'heads' part. Often invoked in Our Little Adventure when Julie is talking with the Palm Tree Ghost. This page was last edited on 30 April 2017, at 12:20.